Source the best candidates with the power of artificial intelligence. Our AI matches every job post with the right talent based on jobseeker information and user behavior data. 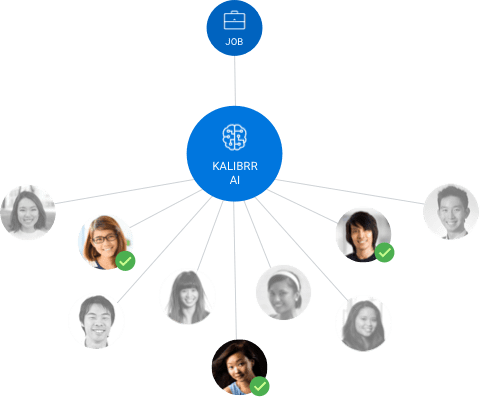 Using Kalibrr's AI, our team of recruitment experts find you top talent from sourcing to endorsement in just a few clicks. Our account managers deliver personalized service in every way—from business reviews to applicant experience feedback. Based on your requirements, our AI finds the best match between our candidates and your job openings. Our recruiters set a meeting to fully align with your hiring needs. Once matched, our recruiters define the shortlist of candidates before endorsing them to you. Finally, interview only the most qualified candidates and choose the best talent for your company.